1st segment: Scot welcomed Fr. Mark back to the show. Scot noted that Fr. Mark’s predecessor as Judicial Vicar for the Archdiocese, Msgr. Robert Deeley, was named as vicar general. Fr. Mark said it’s great to have another canon lawyer who can help him. He said that in the Tribunal they are often working on the same sorts of things that Msgr. Deeley worked on in Rome. He is one of the world’s experts. Fr. Mark is also happy for Fr. Erickson who is going on sabbatical and is relieved of the burden of the office. Fr. Mark said the staff of the Tribunal are happy to have one of their own to come back and serve in a wider role. Scot said every pastoral leader comes with a different outlook on ministry and a different personality based on their own experience. Scot asked Fr. Mark what Msgr. Deeley’s experience as a canon lawyer will bring to the office of vicar general. Scot said his first job in business was in marketing and that has affected how he approaches every job since then. Fr. Mark said the vicar general’s office is very key in the archdiocese and he’s worked with six different vicars general, who all brought something different. Bishop Edyvean, a theologian, approached everything from a theological perspective. Fr. Erickson is a sociologist and a military chaplain, and so approached from that perspective. Msgr. Deeley brings first the canonical, which is good because the archdiocese faces some highly complex canonical issues, but also comes from working at the Congregation for the Doctrine of the Faith, which brings with it some very good connections in Rome. Scot said Msgr. Deeley was requested to be an official at the CDF by then-Cardinal Joseph Ratzinger, now-Pope Benedict. That shows the confidence that Pope Benedict had in him. The Congregation for the Doctrine of the Faith sees all the issues throughout the world, which will give him a sense of perspective for us in the Archdiocese. Fr. Mark said he’d been giving advice from Rome, but was limited in how much he could help by his role. To have him as a resource in the building delights Fr. Mark. 2nd segment: Scot and Fr. Mark welcome Fr. Joe Mozer, who is one of about a dozen priests who work in the Pastoral Center. Scot asked him when Fr. Joe first heard the call. As he entered his teens, his faith became more important to him, especially as his parents were entering into difficulties in their relationship and ultimately ending in divorce. It was a time in life he really needed God’s help. He became more active in his parish, St. Elizabeth of Hungary in Acton, including the youth ministry there. Those activities were a great support in his blossoming faith and to know he wasn’t alone in the challenges in life. At that time, he began considering how he could repay the gift of his faith to the Church and to God. At first he dismissed the idea of the priesthood, but his pastor, Fr. Paul Walsh, pulled him aside after Mass one day and told him that he’d submitted Fr. Joe’s name to the seminary for an open house. He was encouraged by someone outside himself. Fr. Mark said it’s a good trick: Just sign him up and then tell him. Fr. Joe said the open house was for the seminary college. It was a support to the idea of a vocation in the Church that someone else saw that in him. He felt the encouragement there. He didn’t go to the seminary college, but instead went to UMass Amherst and studied mechanical engineering. While there has was very involved in the Newman Center, including a discussion group for those considering a vocation within the Church. They called themselves the Confused Catholics Club. Fr. Mark said a lot of vocations come out of the Newman Club at UMass Amherst, not just priests, but all Catholic vocations. Fr. Joe wanted to go to UMass to experience a broader section of life than he was used to from his own hometown. It was good foundation for his priesthood. About halfway through his time at U Mass, Fr. Joe went to another weekend at St. John’s Seminary, and it became clear that God was prompting him to make a decision. He was ordained in 1997 and assigned to Holy Family Parish in Duxbury. Scot asked Fr. Mark how priests are identified as possible canon lawyers for the tribunal. Fr. 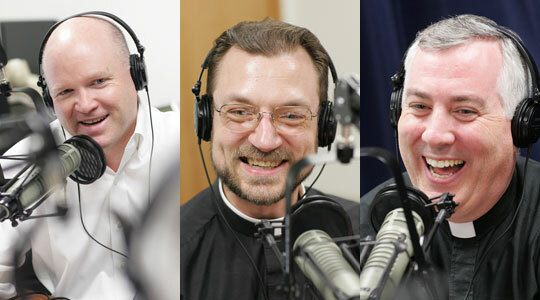 Mark said there is one priest right now who is studying canon law in Washington, DC, Fr. Joe Palladino. Fr. Palladino came to work in the tribunal first, with no prior training, and found out that he was amenable to the work. After that he went off to study for the tribunal. When Fr. Joe was first contacted with the offer to enter into canon law, how did he know that he would want to leave parish life and enter into possibly a lifelong service of the law. Fr. Joe was on a retreat when he got a call from Fr. Mark’s predecessor, Msgr. Foster. A priest-friend of Fr. Joe’s, Fr. Michael Hobson, and Fr. Aidan Walsh, a canon lawyer, were on the retreat with Fr. Joe, and Fr. Hobson encouraged him to consider it. He prayed about it for the week, and considered how his own experience of his parents’ divorce and annulment affected him. The Licentiate in Canon Law now takes 6 semesters or 3 years of study, and Fr. Joe studied at Catholic University of America in DC. He returned to the Archdiocese in 2007 to work in the Metropolitan Tribunal. Fr. Mark said Fr. Joe has a great ministry to the married for the ministry of marriage. He has worked closely with the national Engaged Encounter. Scot asked Fr. Joe how his parents react to this ministry. They have been very supportive of his entering into the priesthood and to serve God in whatever capacity. They understood the workings of the tribunal better than most because of their experience with it. Scot asked Fr. Joe what it’s like to work in the Pastoral Center as a priest. Fr. Joe said he is a diocesan priest and so it’s important for him to live with other priests. He lives at the rectory of St. Mary parish, Dedham. They have several priests so he often helps out at other parishes on the weekend, including Dover and Sherborn at the moment. He works in the offices of the Tribunal five days per week. For the most part, it’s a 9 to 5 job. On the evenings and weekends, he tries to be available to people in other ways, like ministries such as Engaged Encounter. He says it’s odd for him to not see the people face to face that he’s ministering to. 3rd segment: Scot asked Fr. Mozer about his involvement with Catholic Engaged Encounter. He said that Engaged Encounter is one of several options that engaged couples have to prepare for the sacrament of marriage in the Church. It’s important to prepare for the sacraments. Engaged Encounter uses the spirituality and experience of Worldwide Marriage Encounter to bring the experience of married couples, the Church’s teaching, and the lived experience of celibate priests to bear in preparing couples for marriage. They use the technique of dialogue where the couples will write about certain topics and share that with each and discuss that to help them process the issues. When he was in seminary, Fr. Joe observed an Engaged Encounter weekend to understand it better in his ministry in a parish. The Engaged and Marriage Encounter spirituality talks about a complementarity between the committed love of married couples in the Church and committed love of priests to the people they serve. After being ordained, he started writing talks and presenting at Engaged Encounter weekend in Boston and then in Washington, DC, during his studies. Eventually, he entered leadership at the local, regional, and national level. The local Boston website is BostonEngagedEncounter.org. Scot points out that Fr. Joe is a passionate motorcycle driver. Fr. Joe said it’s a wonderful hobby and way to enjoy the road. He got involved because his stepdad rides as well and he and his mom like to go on rides. They invited him to get his license and in the summer of 2004, he got it. He acknowledges it’s a dangerous form of transportation if you’re not careful. He took a safety course and he’s learned to assume he’s invisible to other vehicles on the road. There are quite a few priests in the Archdiocese with motorcycles. He tried to start a club for clergy who ride, but has been unsuccessful. But they’ll often meet up at events like Bike Week in Laconia this week. Fr. Mark said his hobby is golfing. Scot said the Tribunal has many areas that it covers, but it’s most well-known and most frequent task is helping people through the annulment process, which the Church calls a Declaration of Nullity. Fr. Joe said the vast majority of Catholics are called in their vocations to marriage. Unfortunately, some of those marriage relationships are not able to be sustained. AMong them, many are troubled from the start. This is why they call it a declaration of nullity. The word “annulment” can make it sound like we’re choosing which marriages we’re going to make null. But what the Tribunal does it study a marriage—and mainly the courtship leading up to a marriage—to determine whether it was valid in the first place or not. Then they make a declaration now about what happened or didn’t happen on the wedding day. Scot asked what makes a marriage valid and what makes it invalid. Fr. Joe said that’s the heart of his study of canon law and is difficult to condense into a few months. But the heart of it is the willingness and ability of both the bride and the groom to enter into the partnership of the whole of life that the Church understands as marriage. In particular, we’re looking at what God created marriage to be from the beginning. This applies to all people, not just Catholics. For Catholics, they also look at whether they enter into the marriage using the form and the celebration ceremony that the Church requires. Fr. Mark said it can get confusing, but the key thing about declarations of nullity and the theology of marriage in the Catholic Church is all based upon the consent of the couple: the bride saying to the groom I choose you and the groom saying the same to the bride and knowing who they are, knowing what they’re choosing, and know who the other person is. If there is something that is absolutely flawed in that consent, that’s where they declare null. But if there is no flaw in the consent, then they can’t declare it null, because it’s an action that God does and you cannot erase something that God does. Fr. Joe is a judge. Fr. Joe said that he is able to look at the testimony that is gathered from the parties of the marriage, family, friends, and others who know them very well. Looking at that testimony, three judges are able to analyze whether there were solid foundations on which people would have begun their marriage, especially the relationship of their own parents, and then their experience of other marriages outside of their own family. Did they have good examples or poor examples of what marriage is meant to be? If there were a lot of divorces around them, then maybe they thought marriage was only a temporary commitment. Fr. Mark asked Fr. Joe to set the foundation of the whole process: Who needs an annulment and how do they begin the process? Anyone who has gone through the breakup of a marriage and there’s no hope of a reconciliation. (The tribunal’s first ministry to do everything possible to save a marriage.) A person would go through the civil divorce process first to make sure that important things like child custody are provided for. And then if they wish they can approach the Church anytime after the divorce is final, recognizing that divorce doesn’t end a valid marriage. Any Catholic or non-Catholic, especially if that non-Catholic would like to enter into a marriage with a Catholic in the future. The people would begin the process by approaching the priest or deacon or pastoral associate at the parish, who would have the training to become a sponsor for the annulment process. It could be any parish, not even just their own. At the parish level, they would be helped to unpack the marriage to see if there might be a basis for a declaration of nullity. Then they would fill out the forms, usually including a narrative of their experience in their lifetime growing and the relationship. Scot asked, generally speaking, what would be the common reasons there might be a reason for a declaration of nullity. Fr. Joe said he was surprised the extent to which alcohol and drugs are a significant factor. They can make relationships unmanageable. Alcohol abuse itself does not make an invalid marriage, but if one or both of parties coming into the marriage are already in the throes of addiction or experienced it in their family growing up, that can affect their ability to form relationships. Fr. Mark said he’s struck by the people who go hastily into marriage. That it’s just the next step in a courtship and people don’t understand the import of the occasion. Just because you’ve rented a hall is not a reason to go forward with the wedding. If your whole family is saying don’t do it and your best friend is saying he or she is not the one for you, don’t try to prove them wrong. People go through a million red lights and don’t stop to reconsider. Scot asked if you see cases where everything is great for 20 years and then it all breaks down? Fr. Joe said it’s a real challenge to live a real vocation in the Church and when a couple has many great years and only later has problems, it’s most often due to a new obstacle entering the relationship or the parties not making the marriage the primary priority in their lives. Irreconcilable differences is not a ground for nullity in the Church. 4th segment: As we do every week at this time, we will look at the readings for this weekend’s Mass. This week we celebrate the Solemnity of the Most Holy Trinity. Scot said we’ve heard this Gospel many times and we know about Moses receiving the Ten Commandments. Fr. Joe said it’s not a coincidence that we so often see John 3:16 at sporting events on placards, whenever someone is trying to give people a capsulized version of Christianity. It is often referred to as the Gospel in miniature. It is the the essence of who Jesus is in relationship to the Father and to us. God is a relationship of three Persons, Father, Son and Holy Spirit. They are reaching out in relationship to the people God has created. God defines himself as a merciful and gracious God, rich in kindness and fidelity. We have so many Sundays that celebrate who Jesus is and last Sunday we celebrated Pentecost and the Holy Spirit. This week’s reading celebrates the Father and shows him as a loving Father. He is kind and slow to anger. He so loved the world. That’s the loving Father we have. Scot said he loved the Rembrandt painting of the Prodigal Son. It should be better known as the Loving Father. One of the biggest mysteries in our faith is the Trinity. Fr. Mark said we grasp to define God and name Him, but God is other. We can never encompass Him. He offered a quote from Romano Guardini. In Christ, the depth of the hidden life of God is disclosed to us. His being, speaking and doing are completely filled with the reality of the Holy One. But from that reality emerge living figures: the Father in his omnipotence and goodness; the Son in his truth and redeeming love; and between them the selfless, the creating, the Spirit. It is a mystery that passes all understanding; and the danger of objecting to it is great. But I do not want a God who abides by the limits of my own though and how is fashioned after my own depicting. I want the real God, and know that he must exceed the bounds of my thoughts. Therefore I believe in your mystery, living God, and Christ, who cannot lie, bears witness to it. If I wish to share a common intimacy, then I must turn to other people; but, however close we may be, and however deep our love, we are always apart. You, however, find your “other” within yourself. In your own depths you hold eternal converse. In your own richness takes place the everlasting giving and receiving of love. O God, I believe in your triune life. For your sake I believe in it, since this mystery covers your truth. If it is once surrendered, your image fades in the world. But for our sake, too, I believe in it, O God, for the peace of your eternal life must become our dwelling. We are your children, O Father; your brothers and sisters, O Son of God, Jesus Christ; and you, Holy Spirit, are our friend and teacher. That is the eternal life that was ordained for us. Our hope goes out to it. Preserve me, O God, from the light ever being extinguished which shines so distantly and yet with such holiness across to me. Amen. Mystery is not something to object against, but to dwell in. Scot says it is good to pray: Lord, I’m not sure I understand this, help me to understand more. Even though it is a mystery, the Trinity helps me to relate more with God as our loving Father, as our Brother, as His Spirit within us making us holy. The Trinity invites us into the relationship and that we are loved.